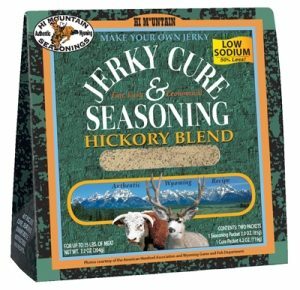 Hi Mountain Hickory Low Sodium Jerky Cure & Seasoning with 50% less salt, the great flavor of one of the most popular smoking woods. Use with beef, wild game, poultry, fish, or any meat of your choice. Each kit seasons up to 15 lbs. of whole muscle meat or 10 lbs. of ground meat. Use with a dehydrator or oven rack method. 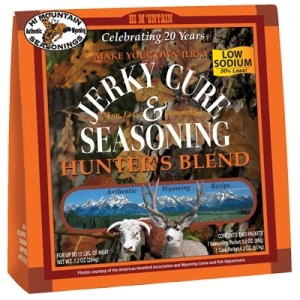 Hi Mountain Hunter’s Low Sodium Jerky Cure & Seasoning with 50% less salt, features garlic, pepper, a hint of hickory and finishing with some heat. Use with beef, wild game, poultry, fish, or any meat of your choice. Hi Mountain Inferno Jerky Cure & Seasoning is truely one of a kind! Made with a spicy blend of Chipotle, Habanero and Jalapenos. Use with beef, wild game, poultry, fish, or any meat of your choice. 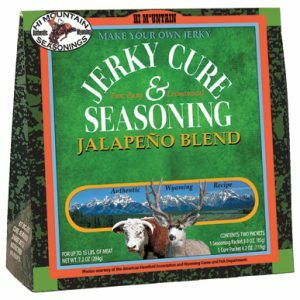 Hi Mountain Jalapeno Jerky Cure & Seasoning has exceptional flavor with just a bit of heat, the perfect partner for jerky. Use with beef, wild game, poultry, fish, or any meat of your choice. Hi Mountain Mesquite Jerky Cure & Seasoning can also be used with beef, wild game, poultry, fish, waterfowl, or any meat of your choice. 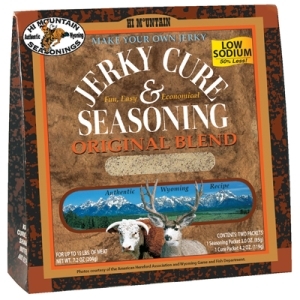 Hi Mountain Original Low Sodium Jerky Cure & Seasoning with 50% less salt, the most popular blend. Created so you can make the World’s greatest homemade jerky. Use with beef, wild game, poultry, fish, or any meat of your choice. 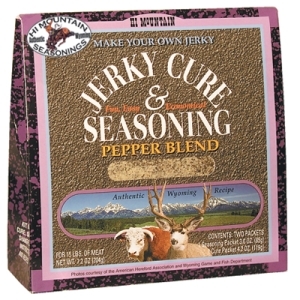 Hi Mountain Pepper Jerky Cure & Seasoning is a bold yet simple flavor, like jerky made in the old West. Use with beef, wild game, poultry, fish, or any meat of your choice. 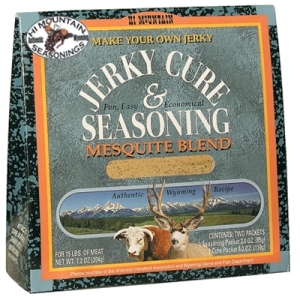 Hi Mountain Sweet & Spicy Jerky Cure & Seasoning is the best of both worlds! Use with beef, wild game, poultry, fish, or any meat of your choice.